SOATest Report Issue - "NaN" displayed in place of Number of Service Calls. I have been seeing “NaN” in place of number of service calls under API Coverage section on SOATest. But, Test Summary Section contains correct details (PFA for screenshot). FYI - I am generating pdf reports on SOATest. The small screenshot does not provide enough detail to say why that happened as well as what steps are required to reproduce. This looks like something you should bring up with Parasoft Support. They would be better able to collect the required information from you, possibly test configuration, assets, logs, etc. Sure, I will contact Parasoft Support. FYI - I have enabled option to generate PDF Report (Preferences -> Parasoft -> Reports -> Format PDF -> Apply Ok. 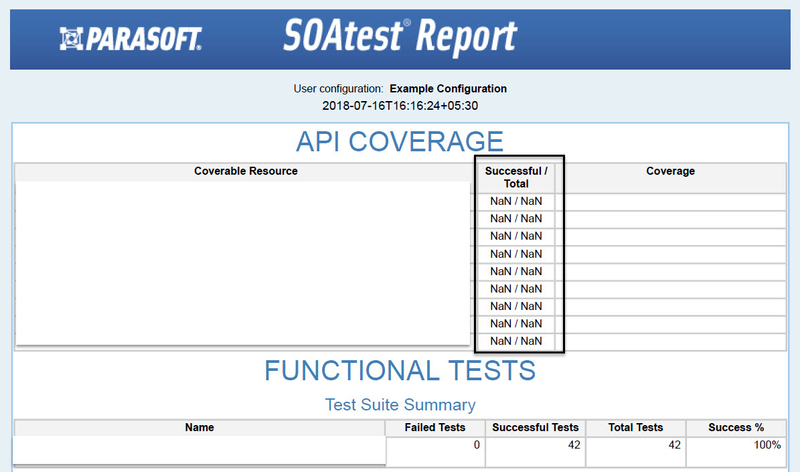 Execute the tests and generate the test report via Generate Report option on SOATest. But the PDF report that I get on SOATest screen doesn't show the correct numbers. Someone from Parasoft will need to troubleshoot this with you. Maybe it is related to creating a PDF report or maybe has nothing to do with that, like if you created an HTML report instead.